The Red Cross Is Using Text Messaging To Take Down Ebola : Goats and Soda Working with the government, the Red Cross sends 2 million texts a month to people in Sierra Leone, reminding them to wash their hands, take their temperature and protect themselves from Ebola. 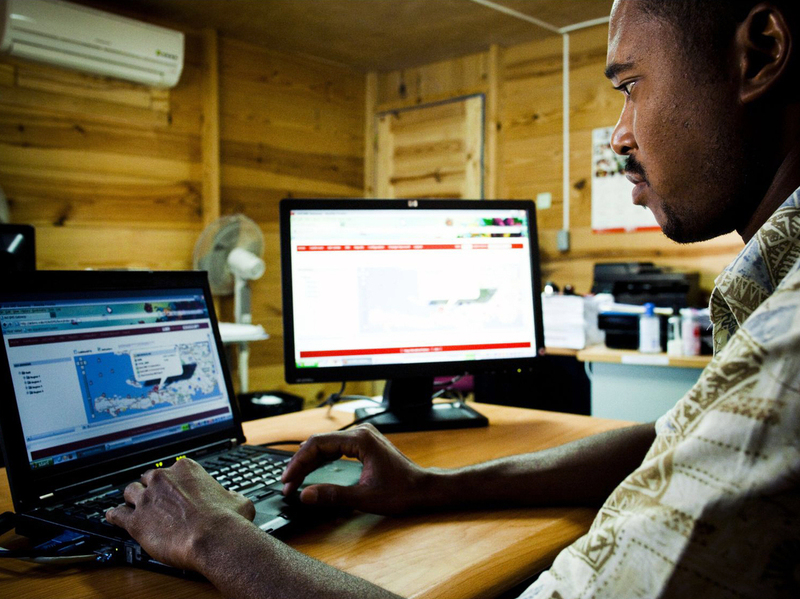 After the 2010 earthquake in Haiti, the Red Cross sent text messages across the country with health tips, locations of aid and safety reminders. A similar system is being used in Sierra Leone to combat Ebola. "If someone you know is sick with sudden fever, diarrhea or vomiting, you should call 117 for advice." "Healthcare workers who take care of Ebola patients have to wear protective clothes do not be afraid of them." "People with Ebola who go to the health centre early have a better chance of survival." In Sierra Leone, cellphone users are as likely to get a text about hand washing as about a social gathering. In an effort to contain Ebola, the International Federation of Red Cross and Red Crescent Societies (IFRC) has teamed up with local cellphone provider Airtel and the Sierra Leonean government to send health reminders via text message. Since the Ebola outbreak began last April, the Trilogy Emergency Relief Application (TERA) system has sent out about 2 million text messages a month in Sierra Leone, reminding people to seek treatment early, avoid physical contact with others and not resist the efforts of community health care workers. TERA, a system created by Bolivian software company Salamanca Solutions and set up by the IFRC, can send a text to every phone turned on in a specific region. The texts are delivered free, so there's no financial burden to the recipient. Texting isn't the only technology being used to combat Ebola. In West Africa, Twitter was abuzz with health tips and reassurance. Social media analytics firm Crimson Hexagon determined that since July, there have been 1.3 million tweets about Ebola coming out of Liberia, Nigeria, Sierra Leone and Guinea, the majority of them discussing treatment. For comparison, since September, 41 percent of tweets coming from the U.S. about Ebola discussed fear. In countries where Internet access is not ubiquitous, cellphones play a vital role in communicating messages directly to a mass audience during health and other crises. Sixty-nine percent of Sierra Leoneans have a cellphone connection, but only 9 percent have a 3G or cellular Internet plan. "Every mobile phone can do text messaging," says Ken Banks, mobile technologist and founder of kiwanja.net, a project that unites cellular technology with social change. "It doesn't matter if it's the cheapest model or the most expensive." This isn't the first time TERA has tackled an emergency. The system was piloted in Haiti after the 2010 earthquake and was first used in Sierra Leone during a 2013 cholera outbreak. 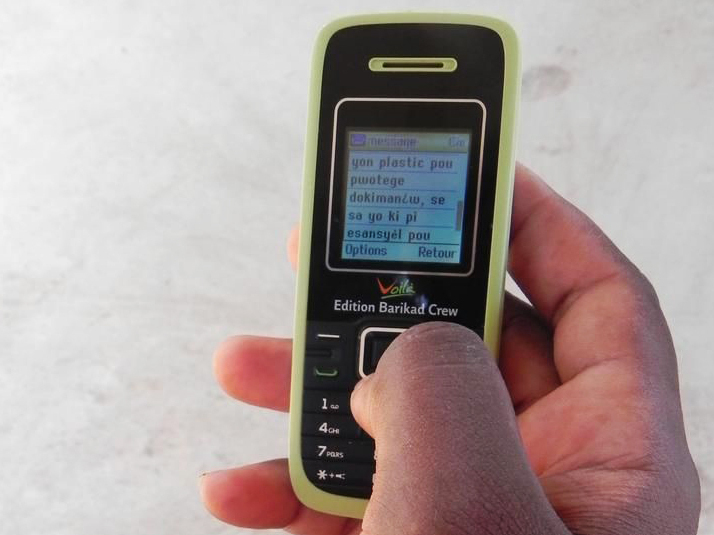 Almost 70 percent of Sierra Leoneans have cellphones, where they can receive text messages. This message, used in Haiti, recommends protecting important documents during floods. The interactivity is appealing. Recipients can text back with basic questions about Ebola and get an automated response with information about treatment options, cleaning tips and medical help. And since the texts are sent to specific areas of the country, the messages, which are drafted by the IFRC and the Sierra Leonean Ministry of Health, can be personalized with regional advice. Even though the country has low literacy rates — 43 percent for adults — text-based services are effective ways to disseminate information. "In villages where there is low literacy, there might only be a few people with cellphones who can read these messages," says Christine Tokar, West Africa programs manager for the British Red Cross. Tokar says those who can read share the information with the town crier, who would distribute it through town meetings. The texts are intended to reinforce similar messages delivered via posters, radio and television ads. But a text can be preserved on the phone, shown to a friend and referenced later — say, when Ebola comes to a previously unaffected area. The Red Cross is hoping to have TERA up and running in 40 countries across the globe in the next five years. "The challenge is getting countries to put the system in place when there isn't an immediate need," says Robin Burton, mobile operator relations officer for the IFRC. 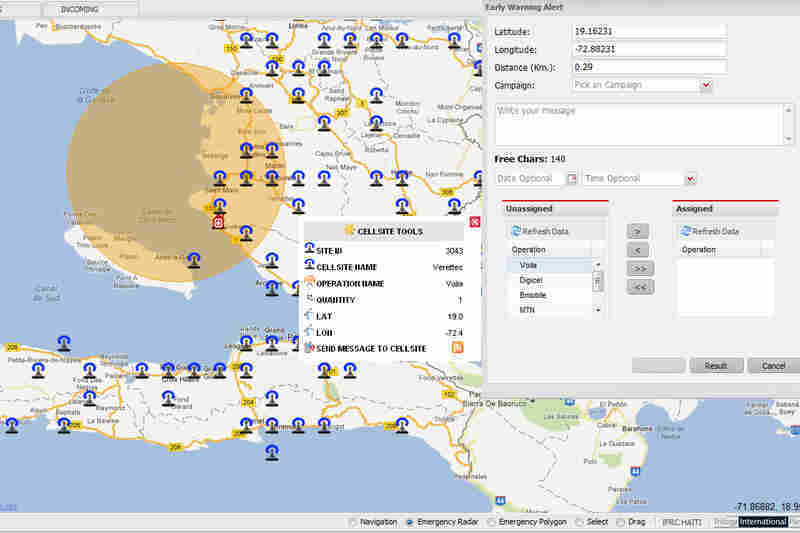 The TERA software shows the operator where cellphone towers are, not the individual numbers being messaged. Using the Ebola outbreak as a catalyst, the Red Cross is hoping to expand the program to seven West African countries in the next few months: Benin, Togo, Ghana, Mali, Guinea Bissau, Gambia and Burkina Faso. This will require buy-in from the countries as well as from a phone company, which may be hesitant. While these texts are seen as useful during a health crisis, users might grow weary of regular "preparedness" messages. The system has been built to appeal to both consumers and cell providers. TERA can only send text messages to phones that are turned on, so networks are not clogged with undelivered messages. In Sierra Leone, the text messages are sent at less busy times for the cell network so the company doesn't need to expand its capacity. For consumers, there is no violation of privacy. No actual phone numbers are seen by TERA operators. And there's an opt-out feature. That's what some Haitians did when they tired of getting messages to wash their hands regularly. Long after Ebola has subsided in West Africa, the TERA system will remain in place for times of conflict or natural disasters. It's currently being used in Nepal for earthquake preparedness. "We hope this will empower people to help themselves," says Burton. "They could send a message back to us saying, 'Thanks for the rice, but we have no way to cook it,' or, 'We don't eat pork here.' We call it beneficial communications because it helps everyone do better."